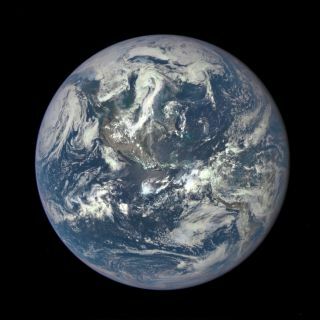 Earth as seen by the NASA/NOAA DSCOVR satellite on July 6, 2015. Four NASA Earth science missions will get axed if the Trump administration's 2018 federal budget request makes its way into law. On the chopping block are the Plankton, Aerosol, Cloud, ocean Ecosystem (PACE) satellite; the Orbiting Carbon Observatory-3 (OCO-3) experiment; the Climate Absolute Radiance and Refractivity Observatory (CLARREO) Pathfinder; and the Deep Space Climate Observatory (DSCOVR). According to SpaceNews, NASA had originally projected to spend $27.9 million on CLARREO Pathfinder, $9.5 million on OCO-3 and $1.2 million on DSCOVR in fiscal year 2018. PACE, which is still in the development stage, had no funds allotted yet. The PACE mission is designed to study clouds and aerosols in the atmosphere and the oceans, using an instrument called the Ocean Color Monitor (OCM). Since the OCM can "see" at a wide variety of wavelengths, including ultraviolet and infrared, it would be able to monitor the clarity of the atmosphere, see how much organic material is in the oceans and even gauge the health of plankton, NASA officials have said. The PACE satellite is scheduled to launch in late 2022. CLARREO Pathfinder is a project that would launch to the International Space Station in 2020 or thereabouts, where it would demonstrate technologies, such as a reflected solar spectrometer, needed for the CLARREO satellite. That future free-flying mission would gather accurate data that would help researchers improve their climate models, NASA officials said. OCO-3 would also be an ISS-mounted observatory, whose mission involves measuring the carbon dioxide in Earth's atmosphere from space. OCO-3 would be able to look at the Earth in three different ways: observing the ground directly below the ISS; measuring reflected light from the Earth's surface, such as over the ocean; and targeting specific areas. The instrument's launch is targeted for 2018. Unlike the other three missions, DISCOVR is already aloft. The spacecraft launched in February 2015 and is currently measuring the stream of particles flowing from the sun, to help warn people on Earth of impending solar storms. DISCOVR is a joint mission involving NASA and the National Oceanic and Atmospheric Administration. It operates from sun-Earth Lagrange Point 1 — a gravitationally stable spot in space about 930,000 miles (1.5 million kilometers) from Earth — and can therefore give up to an hour's warning of an impending geomagnetic storm. Such storms can happen when large clouds of charged particles erupt from the sun and slam into Earth's magnetic field. Powerful geomagnetic storms can damage power grids and temporarily disrupt communications. DISCOVR is supposed to eventually replace NASA's Advanced Composition Explorer (ACE) satellite, which was launched in 1997. DISCOVR also has a camera on board that watches the sunlit side of the Earth and studies daily variations of features such as cloud cover. It is this aspect of the mission that would be eliminated under the new budget request. Overall, the budget blueprint grants $19.1 billion to NASA in 2018, a cut of 0.8 percent from 2017 levels. The agency's Earth science program would get $1.8 billion, down from $1.9 billion in the current year. The White House's proposed budget would also cancel the Asteroid Redirect Mission, which aims to pluck a boulder off a near-Earth asteroid using a robotic probe. This spacecraft would then haul the rock to orbit around the moon, where astronauts could visit it. Trump's proposed budget would continue spending on NASA's Space Launch System megarocket and Orion capsule ($3.7 billion), the Mars 2020 rover mission, and Europa Clipper, which will launch in the 2020s to study Europa, an ocean-harboring moon of Jupiter. But the budget would provide no funding for a proposed Europa lander. The budget request remains just a proposal for now; it will have to be passed by Congress, and so could change in the interim. You can read the Trump administration's 2018 budget blueprint here.